Comment on the Pope's foot washing seems to go and on. I suspect never has this aspect of the Gospel's been discussed so much. Fr Hunwicke has done a good analyses, that is well worth reading. 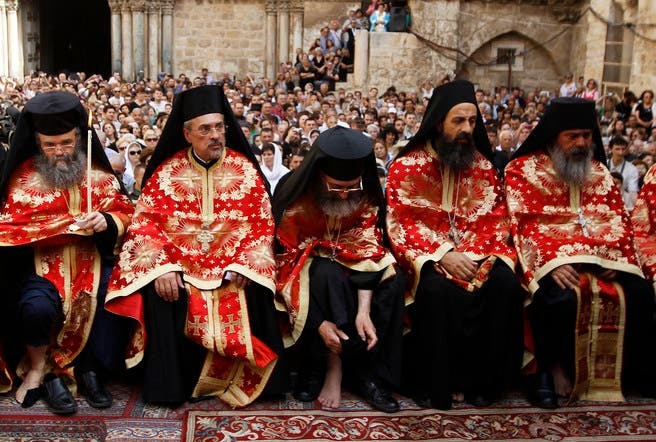 If one takes the Tradition seriously, then the Twelve were clergy at this moment, it is Christ the High Priest washing the feet of his bishops. 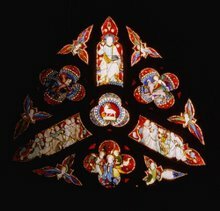 It is as Fr Hunwicke points out an intimate act with intimates. In the liturgy it happened rarely before the Bugnini reforms but I suspect the the most perfect parallel would have been the Bishop washing the feet of the Canons of his diocese, it would have happened in the intimacy of the Chapter House, during Prime, well away from the popular gaze. The clergy of the diocese of Rome are not a happy bunch, three years ago they lost their bishop in events surrounded by mystery, there are hints of intrigue, 'mafia' involvement, a curia 'out of control' and of course 'the lobby' with its enormous power. I think I would feel rather like child of a father who finds it easier to show kindness in the pub or to strangers rather than at home to his wife and children. Closer to home I met with a gang of Westminster clergy recently, most anticipate their own bishop to resign in the next few months. Because of his significance the Archbishop of Westminster has always been a distant figure to his clergy and fear who his replacement might be. Being a Cardinal he tends to only have half an eye on his diocese, unlike other bishops he is forced to rule by diktat or through others. Rarely do his priests sit in the intimacy of his apartment and just chat, nor would a priest with anxieties feel free to ring him up and spend time chatting late at night. None would expect him to drop round for a cuppa and a chat. This is not a criticism of the present incumbent it applies to practically all of Westminster's Archbishops. Neither is Westminster an exception, most bishops are not on 'foot washing' terms with their clergy. 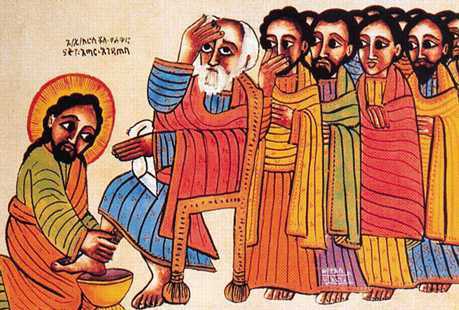 The humble service of Jesus washing the feet of his disciples is the model of charity of a bishop towards his priests and amongst themselves. Bishops who get into trouble are invariably treated as non-persons by their brothers, and more likely to receive a cold shoulder rather than Christ-like charity. A friend, a student of the Venerable English College at the time, told how the students themselves took pity on a former Archbishop of Cardiff and took him out for a drink when he was ostracised by his brother bishops a few months before his resignation. The act of foot washing is a reminder that charity that binds the Church together, it goes with Jesus' own words to the Apostles, "I give you a new commandment: Love one another. In the same way that I have loved you, you are also to keep on loving each other". It is charity expressed in the seclusion of the Upper Room that is the basis of Communion within the Catholic Church, it really is an illustration that charity begins at home and then sets the world on fire, A good bishop is one who cares above all for his clergy and his brother bishops with Christ-like compassion. The morale of many clergy, especially the elderly is very low. Many priest suffer from the festering wounds and are travel sore. Child abuse and the other clerical scandals that have hit the Church have their obvious victims but the more hidden victims are the innocent clergy. Many of us have a sense that our life work will simply vanish, that no-one will be left to continue it, that we will leave nothing behind us. A bishop is not a chief executive, or an administer, he is above all the washer of feet in his diocese, and the feet he is called are the feet of his brothers and sons, the clergy. Why do the clergy think Vincent Nichols might resign, Father? At 70, he is not yet of the age to offer his resignation automatically (75) - is he in poor health? If he does resign, who would you like to see him replaced by? And who do you think will be nominated by the Nuncio? There has been talk of him going to head the new Congregation for the Laity for some time. Some beautiful sentiments, dear Ray... So true about the need for intimacy, approachability and service with respect from our bishops and a reciprocal relationship. While it is true that the actual Upper Room foot washing was just a select group of priests/disciples with the example of that relationship extended thereby to such down the ages, foot washing was a more general act of service in the early Church and can, in principle, be extended to others. Not convinced therefore that the position in the Holy Thursday mass is narrowly mimetic and it involves laity now. Seems a little contrived to restrict to men and to pretend it is to priests therefore? The service, humility and respect is foremost always. 1. In your photo BXVI is washing feet vested in a dalmatic, just as F was wearing a stole deacon-wise. 2 The charity of Cardinal Pell walking an accused priest to court has been thoroughly turned against him. Kevin, I think it is worth reading Fr H.
From an ecumenical point of view, the East has for the most part seen f/w as an episcopal action done to priests on Holy Thursday and done in the context of Mass. In the West it was separated from the Eucharist and done at Prime by a male or female Superiors, it was also done by many who had power to the lesser, my grandfather used to wash the feet of his labourers in pre-war Northern Italy, obviously outside of the context of Holy Mass. With the Pian reforms of Holy Week the Rite was brought to the Western Eucharistic celebration., thus it was given a different meaning. In the Holy Thursday liturgy we are making a deliberate act of imitating Jesus. John chooses sacerdotal language that evokes the preparations of the Aaronic priesthood preparing to sacrifice, so what is being evoked is a participation in Christ's priesthood, ignoring that is a false representation of Christ's action, it is profoundly priestly, it is a sharing in priestly service with those who themselves are called to eventually participate in Christ's own sacrifice. To use the rite indiscriminately would seem to misuse the Rite, to go beyond the meaning Christ intended, that is somewhat blasphemous. If we are not bothered about that how else may we change the meaning of Christ's action or words; with marriage perhaps? "A friend, a student of the Venerable English College at the time, told how the students themselves took pity on a former Archbishop of Cardiff and took him out for a drink when he was ostracised by his brother bishops a few months before his resignation." have you ever written anything bleaker? Beautiful story of washing feet of labourers but I don't think your last point about marriage holds at all as no one intends to change words and theology here. It is perpetuating the intrinsic meaning of the action. Maybe the mistake was to place this in the mass for laity if you feel it must be priestly only. Let the Bishop wash some of his clergy instead by all means but in a lay context, it is the general meaning not the specific occasion, as the Vatican has now clarified. That Jesus' action was aimed at his priests is historically true on that night but what he was saying to them he says to all. We all need his humble example of love and service, and we all need to be washed (ie baptised) not just the clergy. So the focus on preparing his priests had all sorts of levels and implications on that occasion yes, but that was because they were who they were. If this is to be precisely and narrowly replicated then restrict it to bishops and priests theologically as well as historically, mimetically. But the example of service and being washed by grace through the cross is also for all, freely and widely. Thus put this in a lay context, same basic meaning but emphasis and focus shifts, inescapably so. To argue it must be only lay males is a form of play acting , surely. Tell me Father what was Christs answer to Peter the First and what He mean and how did Peter see it as a Jew?? The hermeneutical key to understand the f/w is Christ's response to Peter's refusal to have his feet washed: "You can have no part in me." The same language is used by Peter when Simon Magus tries to buy his way into the priesthood. Peter obviously understood, with the benefit of hindsight, that the f/w ritual had sacerdotal implications just as the ordination of Levites in the O/T involved f/w and other baptism-like rituals. When it is incorporated into the Holy Thursday liturgy with its commemoration of the institution of the priesthood and eucharistic sacrifice it seems banal to reduce its meaning to a more general act of charity. Liturgy by its nature is meant to be anamnesis. Liturgy is about 'authenticity', foot-washing is an 'acting out'. If we can act out this particular scripture why not any other Gospel event? Why a priest doing it? If a women can take the place of the Apostle why not Christ? In the context of Holy Thursday, as we do not believe in the possibility of the Ordination of women, allowing women to act out the Gospel seems the height of inauthenticity. I shall never do it again. As for marriage: I think we are talking about things that connect us with Christ in as authentic context as possible. Distorting the action of Christ in this Rite, which is obviously sacerdotal, seems to invite reinterpretation of any of his words or actions/words in any other context we, or the Pope, might choose. At the moment marriage seems to be a favourite that is up for reinterpretation. It is all about 'authenticity'; which is I presume why so many Anglicans sought admission to the Catholic Church in recent years. Many of us have a sense that our life work will simply vanish, that no-one will be left to continue it, that we will leave nothing behind us. Not so dear Fr. You have your altar servers. Surely you would find one who would enter the service of the Lord and be your successor. Most priests started off as altar servers. The work goes on. .
Fr. Kevin, you make mention of clarification from the Vatican. I'm unsure how anyone could view what the Vatican has given us as clarification. If anything, we are now in a far more confused position. I think what Pope Francis has made clear is that he doesn't believe he needs to pay any heed to the laws of the Church. Sixupman. I wonder if he is the one who had an expensive painting of himself in oils to hang in the Chancery? What vanity! ! The Modernist onslaught has been very far reaching. Just read Iota Unum by Romano Amerio. It explains everything. We need a new Pope to put the Church back on course. Perhaps, just to clarify the meanings of f/w, the Holy Father and others who are likeminded could wash the feet of any and all anywhere and everywhere as the earnest of their humility and charity, and allow the Mandatum to be a rite within or outside of Mass that commemorates Christ's washing the feet of and ordaining to the priesthood the first bishops of the Church--which is surely what He was doing that night. In other words, it is not necessary to pervert the rite in order to wash people's feet. Wash away! When Jesus said he was giving the apostles an example, perhaps He meant the obvious, that those with authority in His Church had to wash each other's feet and so be servants of one another rather than attempting to rule over one another. Might have prevented the Great Schism. in our parish, each of twelve men is identified by name placard as one of the apostles to make very clear what is meant by the action of the priest in persona Christi. For those who wish to feel uplifted in these worrying times may I suggest listening to a programme on KTO (available on the internet) on Saturday evening at 21.42 French time (20.42 time here in Britain). A choir of seminarians from the Monastery of Sretensky will be singing Russian Orthodox Liturgical Chants in the Cathedral of Notre-Dame in Paris. It promises to be a unique performance and unfortunately will only be available live at that time and not available as a video later. You might be right but let us not dare say it just in case, which I pray Heaven, there is a possibility that you are wrong. Father, I agree there is that possibility I am wrong, and wrong I wish I would be, but it appears more and more obvious that I am not. Or rather, the perennial Magesterium appears to "speak" with such clarity that my suggestion is not only not outside the realm of possibility, but rather that it is in agreement with reality. One event from Denzinger keeps haunting me, and that is the account of the Synod of Pistoia. 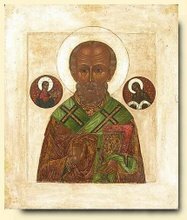 That synod was condemned not ONLY because it uttered unmistakable heresy, but because it appeared to, that is, put forth theological and pastoral positions that we unclear and thereby encouraged heresy. This is addressed in the CCC: para 1697. I the rag they call our Cathedral newsletter we had a photo of our fat archbishop washing the feet of children and women with the title "the archbishop washes the feet woman following the example of Pope Francis". I reply why not follow the example of Christ archbishop? Unthinking and appeasing man. That is why and how we are in a mess. If the citadels of authority set a bad precedent of pursue bad policies we all are imperilled and confused. "Welcome to chaos!"